New Teeth in One Day in Mission Viejo | Orange County Periodontists | Ajay B. Setya, DDS, MSD Robert C. Hirst, DDS, MS Christen S. Bergman, DDS., MS.
Dr. Setya will go over your options for replacing missing teeth in a consultation. Tired of wearing dentures that are loose, irritate your gums and don’t let you eat the foods you like? Or are your remaining teeth so broken down they all need to be replaced? Dr. Setya can give you implant-supported full-arch replacement teeth that are stably fixed in your arch, have near full chewing power, look totally natural and won’t irritate your gums or slip. In the vast majority of cases, Dr. Setya can have you walking out with your new teeth the same day. 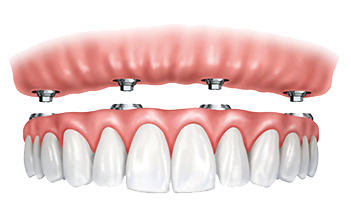 This procedure uses four to six implants to support an entire arch of new fixed-in teeth. With your implant-supported new teeth, your chewing power will go from a mere 10% with regular dentures or 60% with snap-in dentures, to about 90% of full chewing power! For most patients, this means being able to eat all the foods they want. This breakthrough procedure is based on placing four specially-designed implants in strategic positions and at precise angles in the jaw where the bone is of the highest volume and density and can provide the greatest stability. This eliminates the need for bone grafting and makes the procedure minimally invasive. It also allows patients with a lot of bone loss to receive this procedure who would not otherwise have been candidates. Dr. Setya precisely plans your implant treatment using advanced 3D imagery. To determine the precise placement points for the implants, Dr. Setya takes a full set of X-rays and a 3D CT scan. The 3D images created by the scan show where the bone is the most dense and will provide the best support. Dr. Setya will use this information and plan the exact position and angle of placement for each implant. Dr. Setya refers to expert restorative dentists to create your new teeth. These dentists are very experienced in making top-quality restorations out of a variety of high-grade materials including acrylic, porcelain and zirconia. The restorative dentist and Dr. Setya will work with you to determine the materials that will best work for you in terms of strength and beauty. Dr. Setya will be able to extract any teeth necessary and place all the needed implants in both arches the same day. Your final restorations will not be able to be secured until your implants are fully healed, but right after the implants are placed you will have a new temporary, but functional, set of teeth. You will be able to start enjoying the benefits of all new teeth immediately. Dr. Setya will instruct you on what foods you can initially eat and how to care for your new teeth while your implants are healing, and will check the healing progress of your implants in regular follow-up visits. Once your implants are healed, your final new teeth will be fixed in. Your new teeth will look totally natural and will function close to regular teeth. You will able to eat the foods you enjoy and will speak and smile with new confidence! Make an appointment at our office for a full consultation with Dr Setya to find out if you are a candidate for the New Teeth in One Day procedure and if it would be right for you. He will conduct a thorough exam and will answer all your questions. “All in all, this was the best decision I have ever made for my health. I have zero pain from my teeth, I can eat anything now and I want to smile all the time.